For plugging Hi-Z mics into unbalanced inputs. The outer jacket is a durable and flexible matte PVC compound. Since many Hi-Z mics have different pins hot, we give you your choice for your customer’s particular microphone. For plugging Hi-Z mics to unbalanced inputs. 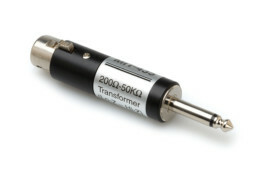 XLR female to 1/4″ mono connectors.